Nothing brings a family together more than a simple roast chicken dinner especially when the cook has a trick up their sleeve. You can skip all the hassle of carving a roast chicken with this simple meal-in-a-pan method. 1. Prepare and preheat your oven to 375ºF. Turn on your convection fan if you have one. 2. Rinse the chicken, pat dry and reserve. Peel and prep your choice of vegetables cutting into bite-sized pieces as need be. Toss together in a large roasting pan seasoning liberally with salt and pepper. 3. Season the chicken with lots of salt and pepper and rest on the bed of vegetables. 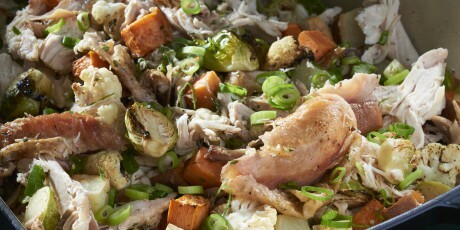 Roast until the chicken and vegetables are browned and delicious, about 90 minutes. A meat thermometer inserted in the thickest part of the thigh and breast will safely read 165ºF to 170ºF. 4. Rest the chicken on the counter or table and gather your guests. When your ready use a pair of tongs to simply tear and tug every shred of meat from the bones directly into the vegetables and juices below. Toss in the green onions and thyme, stir the works together, serve and share!